I'm finding it hard to believe this is the last week of January! To me, January is typically the longest month of the year. For some reason it has flown by quickly this year. Monday: Chicken soup, french bread, salad. I made chicken soup yesterday using up the leftovers in my fridge along with chicken stock and chicken meat that I had in the freezer. We had it last night and will finish it tonight. Tuesday: BBQ pork sandwiches, coleslaw and french fries. I'm using a pork roast I have in the freezer for these sandwiches and will cook it in my Instant Pot. This could easily be done in the crockpot as well. I'll cook the fries in my air fryer. Should be a simple meal. Wednesday: Leftover bbq pork sandwiches. My roast is a 3# pork shoulder roast so I'm planning on enough meat for a few meals. This week I needed to do some restocking of items. I shopped at both Winco and Costco. The first stop was Winco.. There was the regular fruits and veggies. We ate up all the oranges and needed to buy more plus apples and bananas. This was an 8# bag of oranges for $4.98. I picked up spinach, green cabbage, grape tomatoes, celery, onions and mushrooms. Along with milk, half and half, and (store brand) tater tots. I was down to just a few cans of beans on my pantry shelves so I picked up chili beans, black beans, kidney beans and red beans. We really enjoyed the pork steak I picked up a few weeks ago and they were on sale for a great price, $2.28 a pound, so I bought 2 packages. Each package was slightly over 2 lbs. That will be enough to feed us for at least 4 meals. In total, for the meat, I spent $5.50. Making it $1.37 per meal. I think that's pretty good on the budget. Good morning friends! I hope your week is going well. 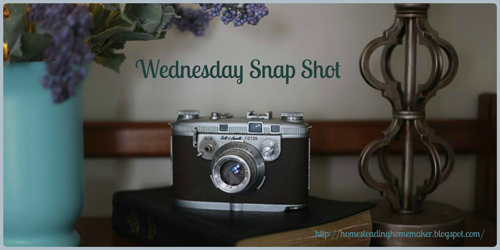 I am happy to have a Wednesday that I am home and able to get this post out early in the day. As I write this I'm waiting for it to be lighter outside to take my 'view from the deck' picture. My weekend was quiet and I was able to make progress on a few needed things. On Sunday I had a 2 hour phone visit with my oldest daughter. It was so nice to talk. We text often, but there is nothing like a phone call :). And we invited his brothers. Pizza was my son's choice and we went to a restaurant that I had never been to and it was some of the best pizza I've had in a while.. It was a fun evening for the 6 of us..
Good morning! 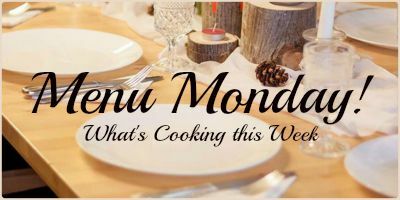 It's time for another week of menus. I hope your week is off to a great start. Monday: Out to dinner. Due to some issues last week we had to cancel my sons birthday dinner. So we are doing that tonight. Tuesday: Chili, cornbread & salad – I didn't get to Costco last week to buy my sausage for my planned sausage & peppers dinner so I made a big batch of chili instead. We are having the leftovers tonight. I made the chili in my Instant Pot and have my recipe for that HERE. Wednesday: Black bean, sweet potato, chicken soup. I have a couple sweet potatoes that are in desperate need of being used up. My favorite combo of flavors is black beans and sweet potatoes with chili powder and cumin. I'm going to turn all this into a soup for dinner. I don't have a recipe for this, so I'll post my end results as a new recipe if it all turns out. I'll serve french bread or biscuits and a salad with this. Happy Friday friends! This week's haul will be a quick one. I only needed to go to Winco. I still had a good supply of food in the house. I was lacking in fresh fruit and veggies and a little dairy. The fruit and veggies. We're finishing up the box of oranges I got a few weeks ago so I only picked up apples and bananas. I had cabbage, peppers, carrots and a few mushrooms still in the fridge so I picked up a bag of lettuce mix and tomatoes for salads. I also picked up some sunflower seeds (not sure why the call them nuts? ), and craisins. I wanted these for salad add ins. I put them into canning jars to store in my pantry. After posting my Make Your Salad Kit earlier this week I wanted to start adding in more simple things to our salads. Good afternoon! 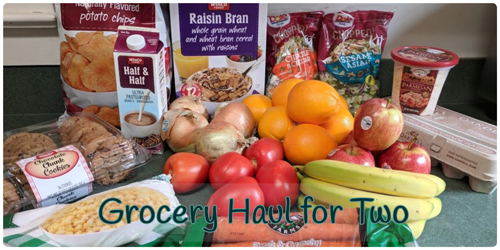 This morning my hubby had to run some errands in town so I went with him and we did the grocery shopping as well. He's having some issues with our van and needed to stop by our daughter's house to pick up a special tool that our son in law had set out for him. Always nice to have 2 mechanics in the family :). My week has been busy around the home. I've gotten caught up with cleaning and laundry (not that one ever actually gets caught up with laundry! ha, ha) and started doing a little decluttering. Not nearly what I wanted to accomplish, but it's a start. Yesterday my daughter and her children came for a visit. I had a great day with her and the grandkids. We were going to go out to dinner with our middle son to celebrate his birthday today but due to the van issues hubby felt he needed to fix, we decided to do the celebrating next week. 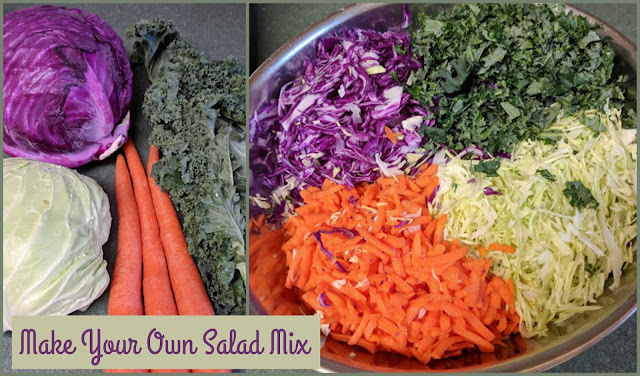 I wanted to share my salad mix with you because I've been loving so much about it. I've been making my salad mix for a few months now. As you may know I'm a big salad person. I (I should say 'we' as both hubby and I are big salad people :) have a salad almost every day. I think fresh veggies are so important in a diet. They're full of vitamins, minerals and fiber; all needed things in a healthy diet. But salads can be a pain to have to make every single day. It's always easier to open a can of veggies or microwave frozen veggies, or skip them altogether. On occasions I have bought those salad kits that come with add ins and dressing to simplify my day. They are super simple! One of the things I took notice of was the fact that many of them contain mostly cabbage. I can see why, cabbage stays fresh much longer than other types of greens do. In the end I began to feel I was paying a premium for cabbage (and a little convenience).